For volumes older than September 2010 visit the old Quipsologies. Chronicling the most curious, creative, and notable projects, stories, and events of the graphic design industry on a daily basis. • Quipsologies, is a division of UnderConsideration, chronicling the most curious, creative, and notable projects, stories, and events of the graphic design industry on a daily basis. • Quipsologies uses TypeKit to render P22 Underground, Skolar Web by TypeTogether, and Coquette by Mark Simonson. UnderConsideration is a graphic design enterprise that runs a network of blogs, publishes books, organizes live events, and designs for clients. Brand New / Displaying opinions, and focusing solely, on corporate and brand identity work. FPO (For Print Only) / Celebrating the reality that print is not dead by showcasing the most compelling printed projects. Brand New Classroom / Providing a space for critique and opinions on student identity work. Speak Up (2002 – 2009) / Discussing, and looking for, what is relevant in, and the relevance of, graphic design. Archives Only. Word It (2003 – 2010) / Encouraging creative diversity in the community through monthly, one-word challenges. Archives Only. Flaunt: Designing effective, compelling and memorable portfolios of creative work / 2010, self-published. Graphic Design, Referenced: A Visual Guide to the Language, Applications, and History of Graphic Design / 2009, Rockport. Women of Design: Influence and Inspiration from the Original Trailblazers to the New Groundbreakers / 2008, HOW Books. The Word It Book: Speak Up Presents a Gallery of Interpreted Words / 2007, HOW Books. 2010 Brand New Conference / A one-day event on the development of corporate and brand identity projects by some of today’s most active and influential practitioners from around the world. Department of Design / Designing corporate and brand identities and full development of printed and digital matter for clients. 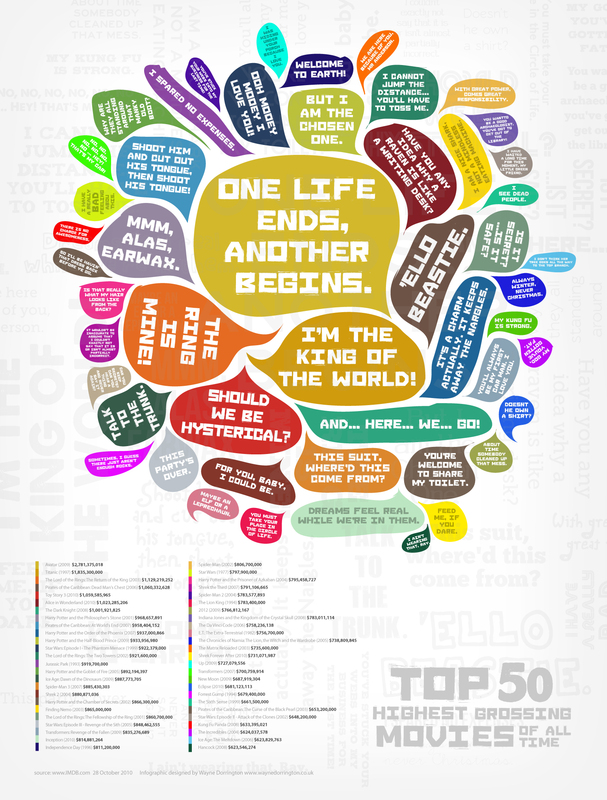 The top 50 highest grossing movies of all time illustrated in quotes, by Wayne Dorrington.